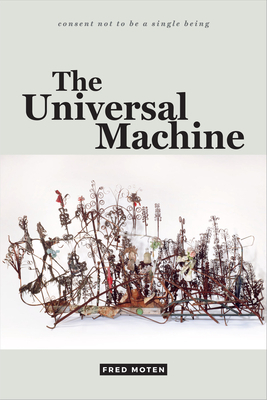 In The Universal Machine--the concluding volume to his landmark trilogy consent not to be a single being--Fred Moten presents a suite of three essays on Emmanuel Levinas, Hannah Arendt, and Frantz Fanon, in which he explores questions of freedom, capture, and selfhood. In trademark style, Moten considers these thinkers alongside artists and musicians such as William Kentridge and Curtis Mayfield while interrogating the relation between blackness and phenomenology. Whether using Levinas's idea of escape in unintended ways, examining Arendt's antiblackness through Mayfield's virtuosic falsetto and Anthony Braxton's musical language, or showing how Fanon's form of phenomenology enables black social life, Moten formulates blackness as a way of being in the world that evades regulation. Throughout The Universal Machine--and the trilogy as a whole--Moten's theorizations of blackness will have a lasting and profound impact. Fred Moten is Professor of Performance Studies at New York University and the author of Black and Blur and Stolen Life, both also published by Duke University Press, and In the Break: The Aesthetics of the Black Radical Tradition.